Syros is an island of the Cyclades and was the capital of the homonymous Prefecture, while now it is the capital of the South Aegean Region. Its capital is Ermoupoli. There was Naval, industrial and cultural center of the new Greek State. Today the Syros appears highly developed economic, development based on many different sources. Tourism, contributing the yard's operation (though with reduced comparatively staff), the longer high agricultural production (mainly thanks to the existence of dozens of greenhouses), the presence of many public services (in Syros there is now only one municipality which resulted from the merger of three of the Kapodistrian Island, and is the capital of the Prefecture of Cyclades, South Aegean region includes the prefectures of the Cyclades and the Dodecanese and the Aegean Appeal) and the operation of the Department of product and systems design engineering of University Of The Aegean. Also the seat and Syros is the Administrative Court,which has territorial jurisdiction in the entire Prefecture of Cyclades. Syros has one of the best harbors in Greece which because of its geographical position is protected from the strong winds that blow at Greece. 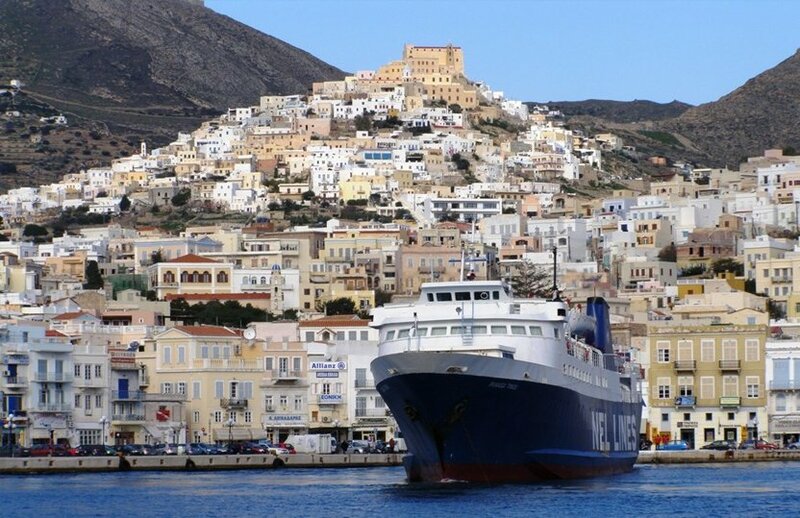 the port there is regular access to the KTEL Syros and ermoupoli municipal transportation. Guests can be served by taxis parked outside the port. Syros is connected daily with the harbour of Piraeus throughout the year. There are also daily connections with the neighbouring cycladic Islands,Tinos, Mykonos, Paros, Naxos and Santorini. Trades are made and to the Dodecanese and Ikaria and Samos. The ferry companies approaching the port of Syros and have started from the port of Piraeus is the Blue Star Ferries, Hellenic Seaways and Aegean Speed Lines. Air Champion24 .com offers ferries to and from Syros on all services performed from any port of Greece. You can easily search and choose your ferry route that it serves, easily and instantly. The booking takes place in real time using your credit card or by making a booking with the help of the staff of our Office.